Fly Casino offers you one of the very best promotions on Tuesday’s. 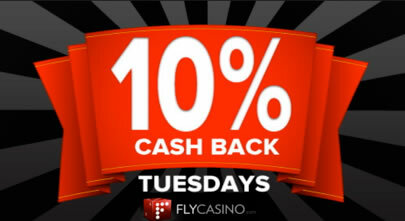 Now, we are soaring your Fly Casino rewards whereby you’ll get 10% Cashback on your net cash deposited losses of 50.00 or more made on Tuesdays in June! NO LIMIT – NO WAGERING REQUIREMENTS ON CASHBACK! Plus...you get 10% Cashback on your losses of 50.00 or more!